In its research for Wohlers Report 2015, Wohlers Associates, Inc., Fort Collins, CO, finds that the market for additive manufacturing (AM), consisting of all AM products and services worldwide, grew at a compound annual growth rate (CAGR) of 35.2 percent to $4.1 billion in 2014. This means that the industry grew by $1 billion in 2014. The CAGR over the past three years (2012–2014) was 33.8 percent. Forty-nine manufacturers now are producing and selling industrial-grade AM machines. Since 2003, the final-part-production market segment has grown from less than four percent to more than one-third of total revenues from AM products and services worldwide (according to the Wohlers Report 2014). 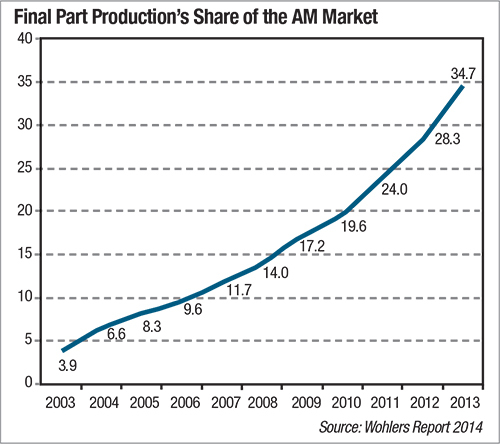 In capturing this share of the market, the use of AM for final-part production grew by 65.4 percent in 2013.